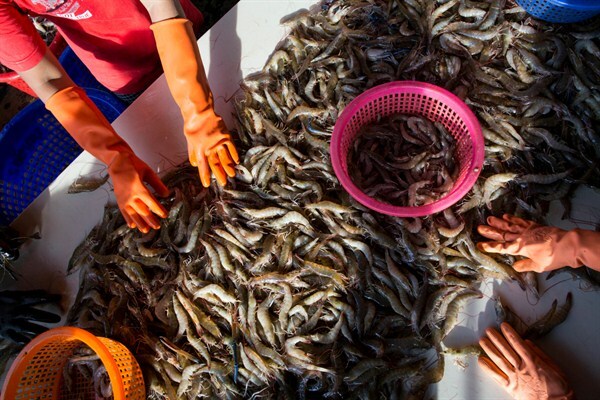 Workers sort shrimp at a seafood market, Mahachai, Thailand, Sept. 30, 2015 (AP photo by Gemunu Amarasinghe). In this week’s Trend Lines podcast, WPR’s editor-in-chief, Judah Grunstein, speaks with senior editor, Frederick Deknatel, and associate editor, Omar H. Rahman, about U.S. President Donald Trump’s speech at the U.N. General Assembly this week, and how the world is adjusting to his outspoken style. For the Report, Johan Bergenas joins Andrew Green to discuss the impact of illegal fishing and why it is shifting from an environmental problem to a security issue as governments tangle over dwindling resources. If you like what you hear on Trend Lines, as well as what you’ve seen on WPR, please think about supporting our work by subscribing. We’re currently offering a 25 percent discount on the first year of an annual subscription to our podcast listeners. To take advantage of it, just enter the word “PODCAST” in the box marked “Coupon or referral code” on our subscription registration form. The Next Resource War May Be Over Illegal Fishing. Is the U.S. Ready? Listeners of the Trend Lines podcast who would like to read more from World Politics Review can sign up for our free twice-weekly email newsletter here. To send feedback or questions, email us at podcast@worldpoliticsreview.com.